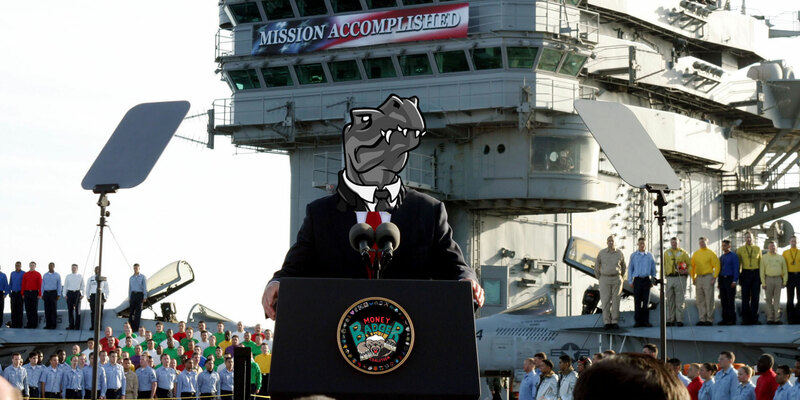 On 16 and 17 May, the Imperium and Money Badger Coalition engaged in a pair of large scale engagements in the lowsec system Saranen. The battle on 17 May was particularly significant, and at its height it saw over 2,500 pilots in local – the highest for World War Bee since the battles of M-OEE8 and UQ9-3C on 28 March and 1 April, which each saw single system totals of around 3,500 pilots. Saranen, in the region of Lonetrek, serves as the staging system for most of the Imperium’s forces. As such it has endured regular harassment from MBC forces. On 6 April, Pwn’n Play capsuleer Pilotsr warped his Avatar titan up to the Quafe Company Warehouse in Saranen, and blasted a Goonswarm Federation carrier on the undock with his doomsday. Imperium losses in Saranen climbed through mid-April, with the worst days being on 10 April when 584 ships worth 56.93 billion ISK were lost, and on 21 April when 299 Ships worth 64.98 billion ISK lost on 21 April. Most of the ISK lost on 21 April came from a failed attempt by a fleet of GSF dreadnoughts to kill a Pandemic Legion titan. Total MBC losses in Saranen that same day totalled less than 4 billion ISK. Throughout late April and early May losses in Saranen dropped dramatically as the Imperium launched a counterattack and fighting shifted into Fade and Pureblind. During this period, daily loss totals for the Imperium in Saranen fell to the 5 billion ISK range. Starting on 13 May with the MBC pushing the Imperium back across the regions, PL led the MBC in a renewed campaign of harassment against Saranen. 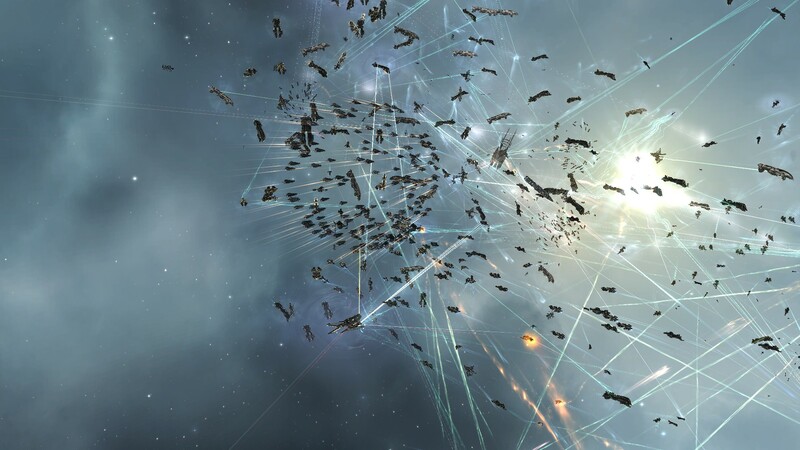 Imperium losses in their staging system began to climb sharply, hitting 9.9 billion ISK on 13 May, 22.35 billion ISK on 14 May, and 17.99 billion ISK on 15 May. Losses were returning to their mid-April numbers, when the MBC was regularly destroying over 20 billion ISK worth of ships a day with camping fleets of super-caps. On 16 May MBC fleets continued their attacks on Saranen, with fleets of subcapitals skirmishing throughout the day. Response fleets formed to try and drive the campers away, but for most of the day, the Imperium fleets once again got the worst of it, including one sortie where 83 Hurricane battlecruisers died in exchange for one Apostle Force Auxiliary and a scattering of lighter ships. However in the late evening NA time (early 17 May EVE time), things escalated rapidly and the Imperium found itself with an opportunity to more than even the score. Pandemic Legion had an Avatar and an Erebus camping the station, and the Imperium sortied a large fleet of Hurricanes to attack them. A quick response from the MBC was able to save both threatened titans, but in the process PL, NCdot and TISHU dropped a number of dreadnoughts and force auxiliaries into the fight, along with an ever increasing number of titans which opened fire on the Imperium subcaps with their new High Angle Weapons. Weathering fire from the massed supers, the Imperium fleet focused its fire on the dreadnoughts and FAXes, managing to kill one MBC dreadnought or FAX about every other minute. Although the Imperium was losing about half a dozen Hurricanes for each capital ship in this exchange, the battle was in their staging system allowing pilots to immediately reship and rejoin the fight. By this point, the call had gone out to several other MBC alliances, and subcap fleets from Pandemic Horde, Spaceship Samurai, and Darkness were closing on the system which was now experienced significant TiDi. Mounting losses eventually forced the Imperium from the field, and they warped off and docked up, leaving a vast MBC armada floating outside. As MBC forces began to depart the system, the Imperium sortied once more, engaging PL, PH, and Darkness forces still around the station, and the numbers increasingly tipped in GSF’s favour. A Horde Ferox fleet was the last on the field, still engaging the remaining Hurricanes when the Goons undocked their “Grindr Fleet” of Apocalypse and Megathron battleships and began volleying the MBC battlecruisers into oblivion. The Mittani even joined in, with HONOR pilot Evan Durpmur’s Ferox becoming his first kill of 2016, although his presence was only realized by the MBC after the battle had concluded. As well as The Mittani in frame, on Djyumene’s overview you can see me running for my life. I missed the Ferox form up and caught up in an interceptor. I was in close attempting to whore on some Hurricane kills with my lasers when I was tackled by Xian in his Condor, delaying my exit when the rest of the Horde fleet bailed. I lit my microwarpdrive and outran the point, but was taking long range fire from the battlecruisers and battleships due to my increased signature. Watching my approaching demise in TiDi slow motion, my Crusader “No Remorse” was at 50% structure by the time I warped clear, only just avoiding adding my name to Horde’s list of battle casualties. When the space-dust settled over the last of the engagements, the MBC had suffered its largest defeat of the war. Killboards showed 472 ships worth 99.2 billion ISK lost for the MBC, including two carriers, six dreadnoughts and twelve FAXes. The Imperium had traded 697 ships worth 55.06 billion ISK for the victory. Hurricane losses were particularly heavy, and there were stories about heroic/entrepreneurial Imperium jump freighter pilots arriving while the battle was still raging to deliver replacements . The battle at Saranen on 16 May was a wakeup call to the MBC, some of whose members had assumed the Goons were nearly finished. On 16 May, GSF had also deployed nine Astrahus citadels throughout Fade and Pure Blind, and a tenth in Saranen. These citadels were all timed to anchor on 17 May, and pilots in the MBC realized that coming off the high of the previous day’s victory, the Imperium might well show for this one, and in force. 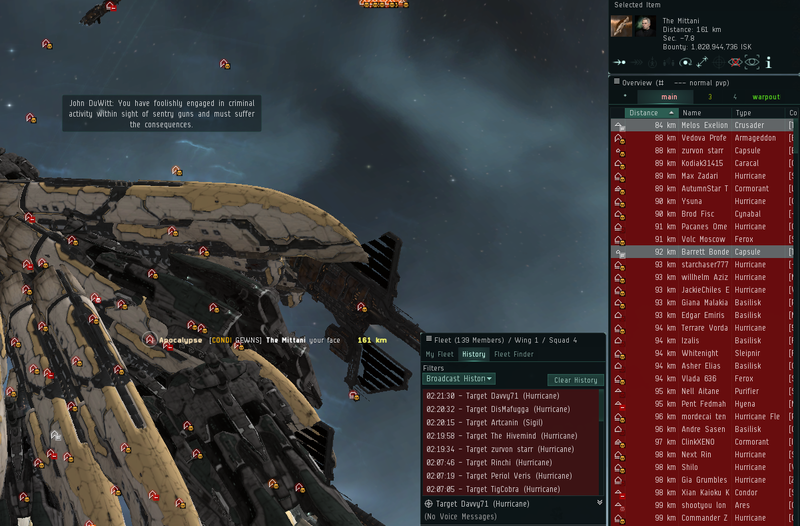 GSF had tried this strategy once before, dropping multiple citadels timed to start anchoring just after server downtime on 11 May. On that occasion six of the citadels were attacked while still in their 15 minute vulnerability window and destroyed before they could come online. In that instance the MBC faced very little resistance from the Imperium’s “Ghost Fleet.” This time the anchoring window for the citadels was timed to fall during EU primetime, which would allow a much more active defense by the Imperium. As the citadel timers approached, multiple MBC fleets gathered in Fade and Pure Blind to strike the citadels there, while larger fleets converged on Saranen from all directions. For Pandemic Horde, much of the citadel bashing fell to a group of fifty stealth bombers, split between three Astrahus, and guarded by a fleet of interceptors and a fleet of Caracals. Mordus Angels and Pure Blind Cartel stealth bombers took the fourth and fifth citadels, a Cerberus fleet from Suddenly Spaceships took a sixth, while another Cerberus fleet from Darkness took a seventh, an HONOR Gila fleet took an eighth, and a final stealth bomber fleet from Brave took the ninth. Imperium attempts to contest the attacks on the citadels outside of Saranen focused on the D2-HOS system in Pure Blind. This system is located in the center of the S4GH-I constellation, which at the time of the battle was still largely in Imperium hands. A trap by a suiciding interdictor, warping into the center of the Horde fleet and bubbling as bombers dropped cloak and launched, opened the fighting between Horde’s Caracals and the Imperium bombers. Continuing engagements across D2-HOS resulted in the loss of some 115 Horde frigates and cruisers worth 3.23 billion ISK, in return for 22 bombers and interdictors, worth 2.81 billion ISK. Sweeps by Sword Fleet also forced the Horde bomber group in ZKYV-W to halt their attacks and cloak until the Imperium interceptors were driven off by Horde’s own fast movers, but this only delayed its demise. All nine citadels were destroyed within minutes of each other, successfully completing the dispersed part of the operation. Meanwhile, in Saranen the main event was just getting started. With the Imperium fleet of several hundred Hurricanes sitting on the Karjataimon gate in Saranen, Circle of Two kicked in the door when their 200 man fleet of Nightmare battleships bridged through and engaged on the gate. As the outmatched Hurricanes warped away, an Imperium Grindr Fleet of Megathrons and Apocalypse landed and was immediately attacked as more MBC forces from PL, Waffles, NCdot, TEST and The Culture, began pouring in from all directions. Local climbed to 2,500, with about 700 Imperium engaged against over 1,500 MBC. The Mittani was sighted again, this time in a Proteus named “Luv2club,” but managed to break lock with a series of ECM bursts and escape before MBC headhunters could claim his scalp. Due to the extreme TiDi, which stayed at 10% for the entire battle, latecomer fleets Darkness and Pandemic Horde were able to arrive following the conclusion of operations in Fade and Pure Blind, adding their firepower to the carnage. The Imperium brawled it out, but their fleet was overwhelmed by the numbers. When it was over, the MBC had lost 93 ships worth 28.73 billion ISK, while the Imperium had lost 391 ships worth 69.18 billion ISK. I participated in the battle as part of tgl3’s Pandemic Horde bomber fleet, and was able to get in on two citadel kills before we moved to Saranen, arriving in the late stage of the fight through the 93PI gate, after taking a moment to admire PL’s artwork. With only 43 bombers and interceptors, the FC wisely kept us out of the main fray, and instead we circled the edge of the battle, picking off a couple billion ISK worth of stragglers and disconnects while suffering few losses. As victorious MBC fleets departed we briefly encountered a smaller group of Imperium bombers who had the same idea as us and were in the process of exploding a dead-in-space CO2 Nightmare, but they warped off before our interceptors could gain tackle, leaving us the last on the field to do some quick looting before jumping for home. Despite suffering much heavier losses than the MBC this time around, the Imperium had not been completely defeated. The anchoring timer for the Astrahaus in Saranen was not affected by the extreme TiDi, and ticked down at the normal rate while all the attacking ships went into slow motion. This left the MBC without enough time to warp to the “Goonristas Rally Point,” and attack it before it finished anchoring. Although the whole operation had been costly for the Imperium, the survival of the Saranen citadel made it at least a partial success. When added together, losses for the big fights on the Monday and Tuesday are near even, with both sides losing around 130 billion in Saranen. 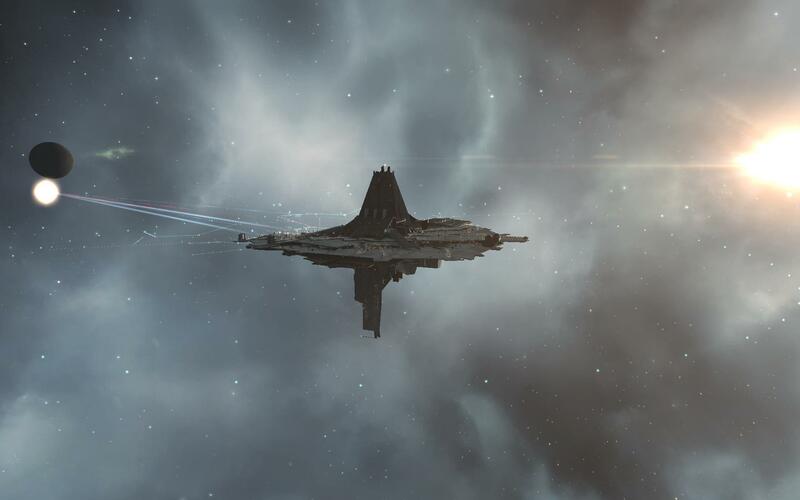 The MBC once again demonstrated the ability to conduct multiple co-ordinated attacks on simultaneous citadel deployments across Fade and Pure Blind. The destruction of those nine Astrahus allowed the attackers to maintain offensive momentum without having to worry about new Goon bases behind the lines. The MBC also demonstrated that it retains the ability to rally overwhelming force from its member alliances when presented a suitable target, such as Goon citadel deployment. This reminder has not been lost on members of the Imperium’s Skyteam. The MBC’s ability to use capitals and super-caps presents a continued problem for the Imperium, whose own super-caps remain inactive. The Imperium’s counter strategy appears to be to target MBC capitals where possible and induce some caution in their use, while at the same time doing what they can to induce fatigue in the subcap forces the capital powers can call on for assistance. Asher believes this targeting in the battle on the 16th bore some fruit in the battle on the 17th, where the MBC only committed a small number of capital ships, and only after the outcome of the subcap battle was already clear. The anchoring of the Saranen citadel also provides the Imperium with more tangible benefits. The citadel tethering mechanic has been shown to greatly reduce the effects of station camping. Although it is too soon to make definitive claims, on 18 May Imperium losses in Saranen fell to 6.81 billion ISK, a sharp reversal of the previous upward trend. While the lifespan of the Goonristas Rally Point will likely prove to be quite short (as is the sad fate of all such anomalies), it should provide the Goons a welcome respite until its demise. 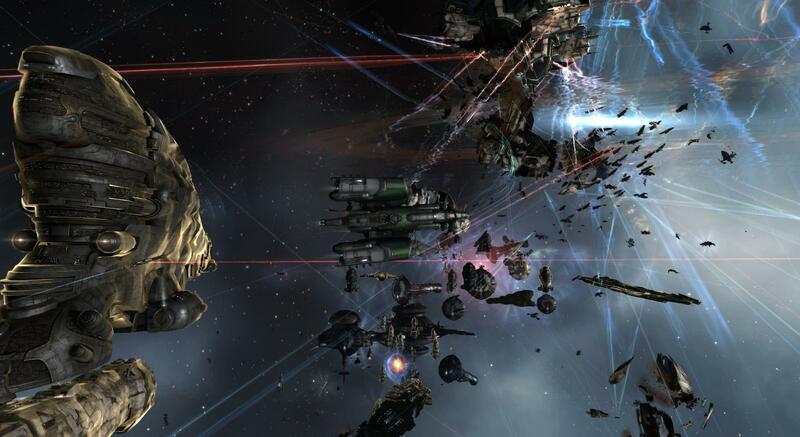 GSF is already deploying several more citadels as potential replacements. The Imperium still controls when and where the next big fight will occur, and Asher has made it clear their leadership still has no intention of feeding large fleets to the MBC for no gain. However, when the perceived gain is worth the cost, the Imperium has also made it clear that it remains willing and able to form, and sacrifice, significant fleets to achieve it. Although the next big fight will rely on the Imperium leadership’s internal calculation of costs and benefits, the fighting on 16 and 17 May showed that there almost certainly will be another big fight – to the enjoyment of pilots on both sides.